Governor-elect Tim Walz and Lt. Governor-elect Peggy Flanagan on Tuesday, Dec. 18 named Margaret Anderson Kelliher as MnDOT's new transportation commissioner, effective Jan. 8, 2019, when the new administration takes office. Commissioner-designee Anderson Kelliher brings both strong leadership and transportation experience to her new role, including having served two terms as the Speaker of the Minnesota House during her 12 years in the Legislature. 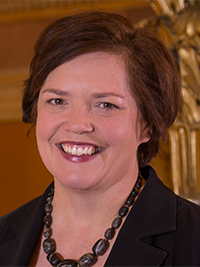 As House Speaker, Ms. Anderson Kelliher oversaw the successful Transportation and Transit Funding package in 2008, which created an investment of new and dedicated funds into Minnesota's bridges, roads and transit system. She also served 10 years on both the Transportation Policy and Transportation Finance Committees. Growing up on a family farm near Mankato, Ms. Anderson Kelliher now lives in Minneapolis and is married with two adult children. She has served on many volunteer community boards, including chairing the Governor's Broadband Task Force, Minnesota State (formerly Minnesota State Colleges and Universities), Greater Metropolitan Workforce Development Council and Textile Center Board of Minnesota. Ms. Anderson Kelliher graduated from Gustavus Adolphus College with a BA in Political Science and Harvard's Kennedy School of Government with a Master's in Public Affairs Mid Career.